Note from The Night Train: I’m proud to welcome a co-author to this blog post — my husband Scott, who knows a lot more about the Civil War than I do. In the Gettysburg Address, Abraham Lincoln foretells that this nation shall have a new birth of freedom. If it did, January 31, 1865, is America’s re-birthday. The Emancipation Proclamation usually gets the glory for freeing the slaves, but Lincoln knew that the Proclamation would be challenged in court after the war was over. That’s why the Thirteenth Amendment was so important — no court ruling can overturn a constitutional amendment. One hundred and fifty years ago today, the House of Representatives passed the Thirteenth Amendment to the United States Constitution, eradicating slavery in America for good. Fernando Cortez Beaman, ca. 1860-1875. Via Library of Congress. Fernando Cortez Beaman was orphaned when he was 15 years old. Born in Vermont in 1814, he was living in Chateaugay, New York with his huge family — he was one of 12 children — when both of his parents died. But Fernando kept it together and finished school at the Franklin Academy, in Malone, New York. Then he moved to Manchester, Michigan in 1838, where he began to practice law. In the 1840s, Beaman briefly shared a practice with Thomas Cooley, who later became a Supreme Court Justice and is the namesake of Cooley Law School. In 1848, Fernando — previously a liberal Democrat — switched to the anti-slavery Free Soil Party, a short-lived single-issue party that boasted many eminent Michigan soon-to-be Republicans among its ranks — so many that there still exists a Free Soil Township, Michigan. In 1854, those Free Soilers, along with rogue Whigs, Democrats, and others who feared the expansion of slavery into the new American territories, met in an oak grove in Jackson, Michigan, to unite into a new anti-slavery political party, Michigan’s Republican Party (some claim it to be the first Republican party in the United States). Fernando Beaman was among the organizers of the oak grove convention. At some point he moved to Adrian. He was the Mayor of Adrian! But more importantly, for the purposes of this blog post, in 1860 he was elected to the House of Representatives, defeating an opponent from St. Joseph named S.C. Coffinberry. Despite a redistricting in 1862 that moved Beaman to the 1st District, which included Wayne County — full of political heavyweights and the biggest cities in the state —Beaman kept his seat and served five straight terms. Born in Southington, Connecticut, in 1821, Charles Upson was the son of a farmer, became a diligent student and later a teacher, and attended Yale Law School for a year before migrating westward to Michigan. Thomas M. Cooley, in an essay for the Pioneer Society, reports that Upson settled in the village of Constantine, Mich., the home of Governor John S. Barry, and at that time one of the most prosperous and intellectually rewarding locales in the state. Upson set up in Constantine as a teacher at the village school, where one of this students was future tobacco baron and Michigan governor John Judson Bagley. The two men established a life-long friendship. While a teacher, Upson studied the law, becoming licensed in 1847. What followed after a couple of years of private practice for this young lawyer of promise in the old Northwest was a laundry list of offices and positions up the judicial and political chain of promotion and merit. County clerkships, prosecuting attorney, state senator, commissioner, attorney general, and finally in 1863, Representative in Congress, where we find him on January 31, 1865, voting in the affirmative. John Wesley Longyear, born in Shandaken, New York, came to Michigan in the 1840s. Here, he achieved his legal education and admittance to the bar by “reading law,” something you could do in those days. (I guess you had to, in frontier towns where there were no law schools.) He opened a law practice in Lansing with his brother Ephraim in 1847 — the same year the state capital moved from its stately digs in Detroit to a hastily-constructed wooden building in that city, then the middle of nowhere. Longyear may have been the first member of the bar to practice in Lansing. Sixteen years later, in 1862, Longyear was elected to Congress — his first election to political office. On April 30, 1864, Longyear gave a speech urging Congress to take action on a plan for re-admitting Southern states after the war — made, I think, in support of the Wade-Davis Bill, the Radical Republican approach to Reconstruction, which would require a majority of the voting population of a Southern state to rebuke the Confederacy and give black males the right to vote before being readmitted to the Union. Wade-Davis passed Congress in July 1864, but Lincoln never signed it, favoring his own, more lenient Reconstruction plans. In one breath he tells us that the enormous expenditure of money by the Government is for private speculation, for filling the already plethoric pockets of Government contractors and corrupt rulers; and in the next he tells us that he votes for all appropriations the administration asks for. I suppose this is what he calls being a “war Democrat.” Does he thus vote, Mr. Speaker, because he disbelieves the sentiment expressed by him? Or does he feel himself compelled to do so by the indignant frowns of his constituents into whose minds he has not yet succeeded in instilling those sentiments? Sir, a compulsory patriotism of this sort is poor material upon which to rely for the support of the Government and the salvation of the country in perilous times like these. Ephraim received the telegram when John W. Longyear, at 54 years old, died unexpectedly on March 11, 1875. His death was mourned by Detroit’s judges, and lawyers, and perhaps ship captains and business owners, and certainly a few of those who remembered his service to the country as a legislator, politician, Radical Republican, and yes-vote for the Thirteenth Amendment. Francis W. Kellogg. Via Library of Congress. Kellogg was not well educated, but he did know how to talk. A well-known temperance lecturer, Kellogg was elected to the State Legislature in 1856 and then to the U.S. House of Representatives in 1858. He was re-elected in 1860 and again in 1862. There are so many reasons and so many arguments that might be urged in behalf of this measure that I hardly know where to begin. It seems to me that our prosperity as a people, our progress in civilization, and our duty to mankind, demand such an amendment of the Constitution, and that if we evade it we shall be guilty of treason to human liberty and human rights. The average loss on these lakes is twice as great, in proportion to the number of men and vessels employed, as it is on the Atlantic. … In four years previous to and ending in 1851, over FIVE HUNDRED LIVES were lost, and upwards of TWO MILLIONS of dollars worth of property. This loss falls almost exclusively on the early settlers of a new country, and is owing mainly to the absence of harbors, and obstructions to the entrance of those which do exist. Surely something should be done by the national government to save these men, who are subduing the wilderness and who traffic on these waters, from so much suffering and loss. After the Civil War, Kellogg moved to Mobile, Alabama, for a federal job as a revenue collector. He was again elected to the House, this time as a Republican representative from Alabama, in 1866. August C. Baldwin, via the National Archives. The most interesting vote for the amendment by a Michigan representative is the one cast by Augustus C. Baldwin. He was the only Democrat of the bunch, and one of the 14 Democrats who voted against their party for the amendment. The central drama of the movie Lincoln is the challenge of getting enough Democrats to vote for the amendment, and even with all of the Democrats who did switch sides, the amendment only passed by two votes. Baldwin’s was one of those votes. Like the other Democrats who voted for the amendment, Baldwin was a lame duck congressman. But his particular situation — and his motivation for voting for the amendment — is perhaps too complex and individual for Spielberg to use in his movie. Baldwin was born in Salina, New York (now Syracuse) in 1817. He moved to Oakland County, Michigan, in 1837, at the age of 20, and taught school while studying to become a lawyer at a branch of the University of Michigan that existed in Pontiac at the time. He moved to Milford, where he built a successful and lucrative legal practice, and entered politics soon after, getting elected to the State Legislature in 1844, while still in his 20s. He became prosecuting attorney for Oakland County in the 1850s and became deeply involved in national Democratic Party politics. Baldwin’s only term in the House of Representatives was in the 38th Congress that carried out the passage of the Thirteenth Amendment. He was the only Democrat to win election to the House from Michigan in the entire decade of the 1860s. After his term ended (more on that in a moment), he stayed active in politics and the Democratic Party. He became mayor of Pontiac in 1874, and was elected judge of the Sixth Judicial Court of Michigan in 1875. He’s referred to as “Judge Baldwin” in all of the biographical sketches I found. All of these sketches mention his extensive art and book collection (reportedly as many as 12,000 books). You could keep pretty busy on a history scavenger hunt in the public buildings and private collections of Oakland County trying to locate where his art and books ended up. He died in 1903, outliving most of the congressmen who voted that day. Now, about that vote. If you remember from the movie, Lincoln got many of those lame duck Democrats to either vote yes or abstain from voting by offering political offices after they left Congress. It is unclear that this was the case for Baldwin. I have found no record yet of Baldwin receiving a federal position in the year after the war ends. The paeans to him that come toward the end of his life laud him for being on the right side of history. But the key to understanding the vote may lie in the results of the election of 1864 which made him a lame duck on that last day of January 1865. Baldwin’s opponent in 1864 was Roland E. Trowbridge, whom Baldwin had defeated in 1862 for the Michigan 5th District seat. When the local results came in, they had Baldwin the winner by a mere 125 votes. But for the first time in world history, a republic — our republic — held a general election in the midst of civil war, and the soldiers got to vote. And when their absentee ballots arrived, they were overwhelmingly for the Republican party, and in Michigan’s 5th District, overwhelmingly for Trowbridge. With the added army ballots, Trowbridge won the election by 710 votes. Here’s where it gets interesting: A Michigan Supreme Court case the following year decided that the soldier voting act of 1862 was unconstitutional under the Michigan Constitution, which stated that all voters must cast their ballots locally. Therefore, under Michigan law, Baldwin is the winner. So Michigan had a major problem on its hands. Its constitution said one thing. But the Michigan soldiers endangering their lives for the Union expected their votes to count. The matter landed back in the Republican-controlled U.S. House of Representatives, to the Committee on Elections. So Baldwin had a legal case, but needed Republicans in Congress to back him in order to be given a seat at the 39th Congress. Was Baldwin’s vote for the Thirteenth Amendment part of a political calculation, so the elections committee would favor him over his rival? If it was a political calculation, it didn’t pay off. This speculation set aside, we do have at least one source that describes Baldwin’s actions on the day of the vote: Edward W. Barber’s speech on “The Story of Emancipation” to the Michigan Pioneer Society. Baldwin voted against the amendment the first time it came to a vote in 1864. 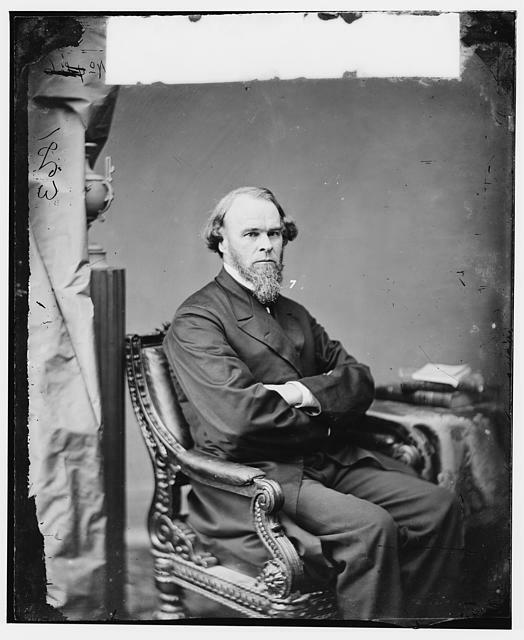 On the morning of the 1865 vote, Baldwin tells Rep. James Ashley, the sponsor of the amendment (played by David Costabile in the movie), that he will vote for the amendment this time, and tries to talks his fellow Democrat Samuel Cox of Ohio into changing his vote as well. Is this story true? There’s no mention of it in the official proceedings of that day. Was Baldwin’s vote on the right side of history but for the wrong reasons? Or did he follow the will of the citizens of Michigan in wanting slavery abolished forever? What were his motivations? (For more detail on Baldwin v. Trowbridge, check out this essay from the Florida State University Law Review, in pdf). John F. Driggs, ca. 1865. Via the National Archives. Yet another New York-born Michigander, John F. Driggs represented Michigan’s 6th district, “the big district,” as it included the entire northern part of the state, including the Upper Peninsula, from 1863-1869. Driggs’s “grandsires” fought in the Revolutionary War. His father never allowed the family to settle in one place for too long, moving his family all over New York state over the course of years. Charles Richard Tuttle, in his General History of the State of Michigan, gives us the story of the genesis of Driggs’s anti-slavery convictions. His father moved the family near West Point, where young Driggs would visit with “the old soldiers who lived in that patriotic region” and listen to their stories, from which “he imbibed those strong sentiments of hatred for slavery and oppression, and that love of liberty and justice which has so prominently influenced and controlled his after life.” Finally, the father moved his family to New York City, where Driggs got the opportunity to acquire some education at the public schools there. He married, and shortly after, Driggs was given, “without application,” a curious appointment as “superintendent of the penitentiary and public institutions on Blackwell’s Island” (now Roosevelt Island, on the East River of New York City) and his wife was provided the title ”matron of the penitentiary.” Apparently, his duties were performed satisfactorily, but I wonder the cause of the appointment (“Why, that young Driggs seems a lad of promise! Let’s have he and his wife run the jail!”). Driggs left New York in 1856 for East Saginaw, where he entered the lumber business. A year later, he was elected to the “presidency” of the village of East Saginaw. After helping the village incorporate as a city, he was elected to the state legislature in 1859, and then elected to the newly formed 6th Michigan District in 1862. An excellent treatise on the Michigan role in passage of the Amendment. Michigan was the third state to vote in favor, on Feb. 3, 1865, when the Legislature approved it.